Liebesbotschaft International: Melon paletas, surf camp + winner. the skin on her thighs is grazed and bloody (note to self: wear long neoprene suit next time) and sunburned (note to self: use sunscreen with a SPF 150 next time), her clothes are drenched (note to self: bring hard-top case instead of duffle bag next time) – and as soon as she’s been home for a few hours she announces that she already misses the sea. Both things are – despite temperatures like Southern France – a bit hard to come by in the Stuttgart region, we offer consolation in the shape of freshly made beds, clean sanitary facilities and warm blueberry scones for breakfast. 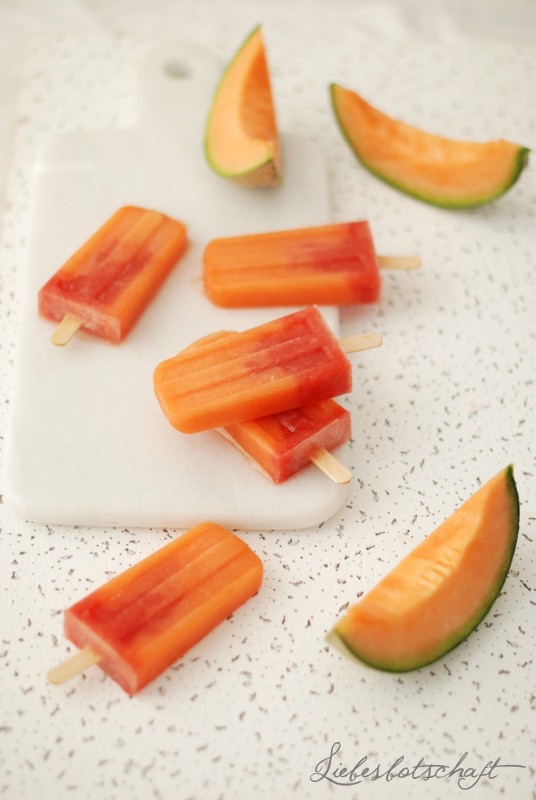 And refreshing melon paletas in the afternoon. The images of the surfers are taken by the local photographer – I wasn’t there myself (same as last year). Neither was Ben, by the way, who isn’t even allowed in the water thanks to his fractured wrist. 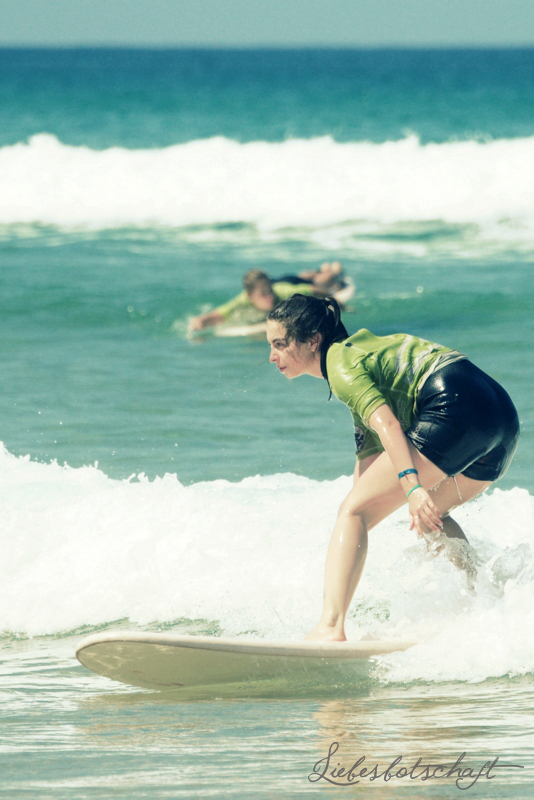 This is why we decided to send the children surfing again towards the end of the summer holidays – this will help with Noelle’s yearning at the same time ;). For the first layer bring water and sugar to a boil and let cool. Stir in the puréed melon and distribute among the popsicle molds (don’t fill them up completely). In the meantime bring water and sugar to a boil and let cool for the second layer. Stir in puréed melon and grapefruit juice. 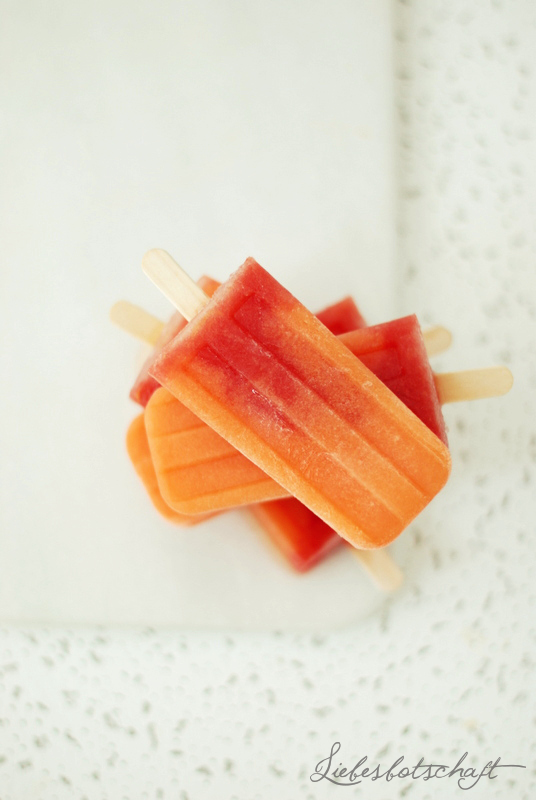 Take popsicle molds out of the freezer and add the watermelon purée on top of the first layer. As soon as the pops are half-frozen, insert popsicle sticks and let freeze over night. 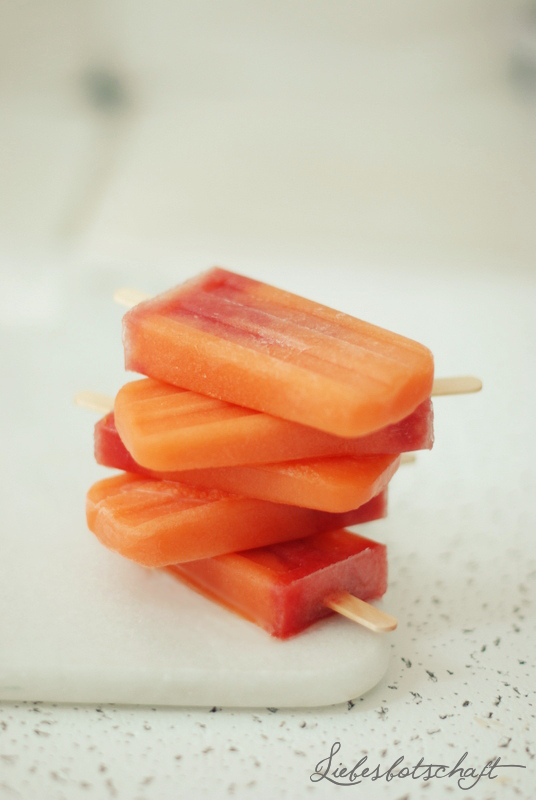 Rinse molds briefly with hot water and take out ice pops. You may also just prepare one of the layers – my children favored water melon! besides breathtakingly beautiful photographs it contains a wonderful selection of ice-cream recipes catering to every taste and at different levels of difficulty. So pretty for the summer months! 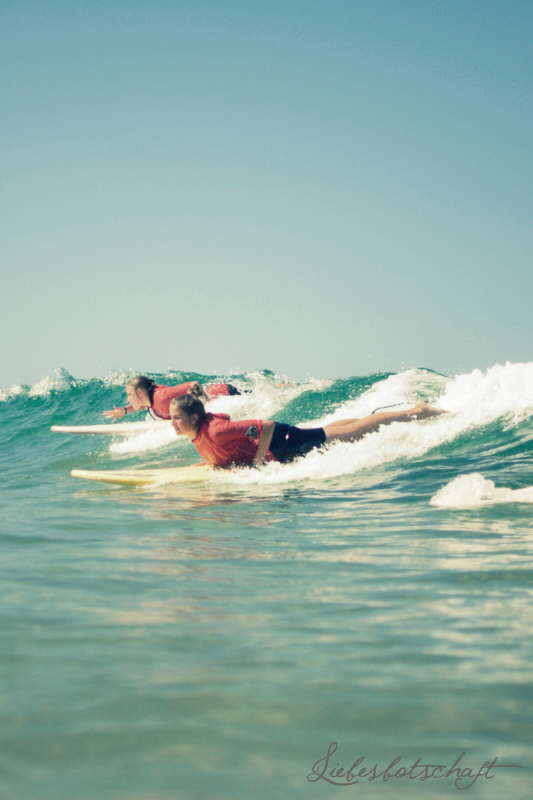 Should you toy with the idea of going surfing yourselves: book the Dutch youth camp. You might not be able to understand a word, but they have comfy chill-out areas with tons of pillows, huge surf posters, home-made stylish gazebos strung with fairy lights, which create a wonderful atmosphere in the evenings, and even live music with cute boys playing the guitar. The German camp, on the other hand, has two hammocks (that are constantly occupied). But well, something’s always wrong. Congratulations, my lovelies, please mail me!